Today was a warm day in Johannesburg. Winter here has been really cold and unpleasant…although nothing compared to some of the snowy/icy countries, we are not really geared for very cold weather, as central heating is very, very uncommonly found in houses here. I am assuming that you are able to do Judy’s Magic Cast-on, as well as Magic Loop knitting. 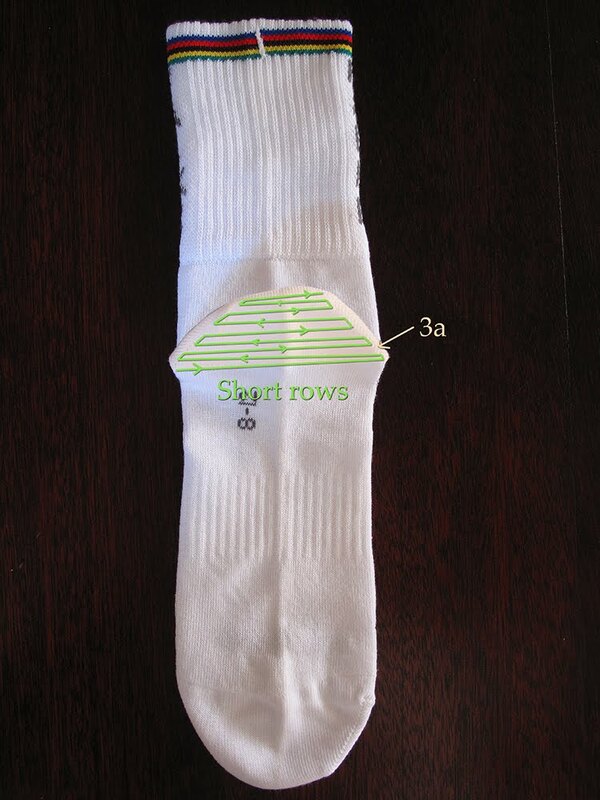 Really friends, this is essential…you must be comfortable with these techniques if you are to reach the end of this quest…I knit my socks from the toe up, using a Magic Loop technique, and I prefer the look of a short-row heel. OK, if you haven’t ever knitted a sock, this will all sound Greek…never fear friends! All will become clear as we go along… I will stick to the kind of sock I like in terms of explanations, and if there is any interest, I can do some posts later on the other options for heels, toes etc. 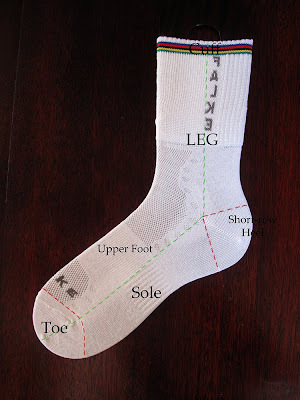 Firstly, let’s look at the anatomy of the humble sock (Mr P’s cycling sock 😉 ). The toe is …well…the toe! This is where I start my socks, as I find the advantages of working “toe-up”, outweigh the “cuff-down” method. At the end of these sock related posts, you will be able to knit two sock at the same time, on one circular needle, toe-up, with short row heels) Wow , you might say…me? Yes, you will be able to do this magical thing! 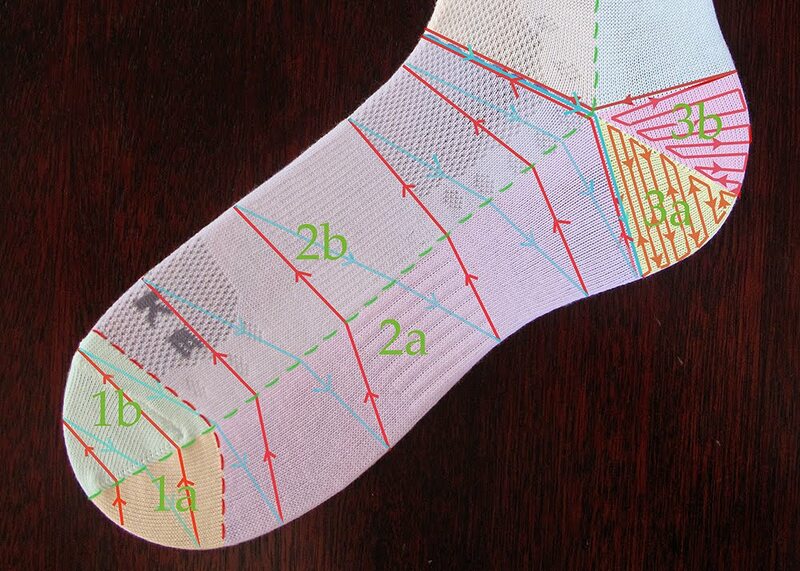 This way of knitting socks, allows you to measure the sock on your own foot (or presumably the foot of the intended recipient) so you end up with socks that actually fit properly, you will have the same tension throughout your socks, as you are creating both at the same time, you will not suffer from the dreaded “second sock syndrome” , and you will be able to use up your yarn to the last bit…because you just keep knitting up to where the yarn starts running low…then you cast off! Voila, socks a-la-deux!So, (I get easily distracted…) the sock starts at the toe (1), you then get the sole and the upper foot (2), the heel (3) , the leg section (4), and finally the cuff (5). I use Judy’s Magic Cast-on method for casting on for the toes. If you are unfamiliar with this technique, you can find a tutorial here. (In this post, I am merely giving you an overview of the process…the details will follow in the subsequent posts). This method of casting on, will give you a set of stitches on the one needle of your circular needles, and stitches on the other needle. 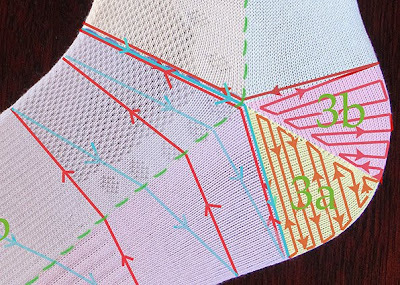 The number of stitches will be the same on the two needles. If you look at the pic above, you will see that I have divided the sock into two coloured halves…the rose coloured part which will be knitted on the back (or farthest-away-from-you) needle, and the turquoise coloured part which will be knitted on the front(or closest-to-you-needle). 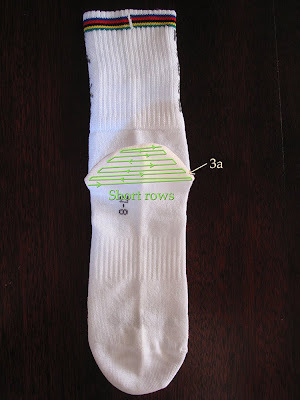 If you are unfamiliar with Magic Loop knitting, look here. -then you will knit the whole of the heel on the front (closest-to-you) needle, starting with section 3a (you finish knitting this completely before you move onto section 3b…this is different from the previous sections of the sock where you are alternately knitting ” a ” and ” b ” in a continuous spiral ), then knit section 3b . During this heel knitting adventure, the back needle stitches go into hibernation..they’re quite happy..don’t worry about them 🙂 .